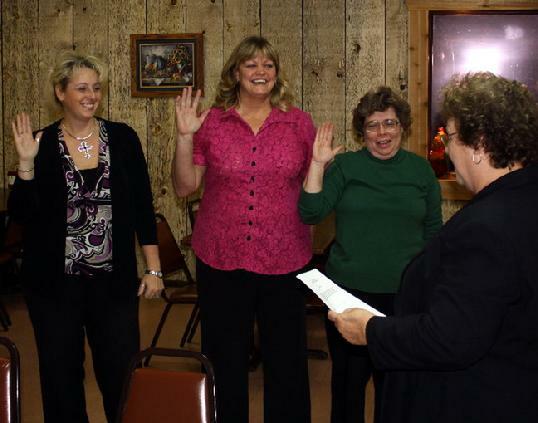 (L - R) New Officers Stacey Poteete, Debra Courtney, and Nita Gokey are sworn in as new officers by Region 11 Director Carolyn Allen. Appraisal Officers Meet Regularly to Better Serve, LIVINGSTON, November 6, 2009 - If you like the idea of having local law enforcement (Police Officers, Sheriff Deputies, Troopers), local roads to drive on, schools for our kids, public records, a court of law, etc. then thank your local appraisal district. Once a month the Texas Association of Assessing Officers (TAAO) meet to exchange ideas between member districts in an effort to enhance the appraisal profession. The Piney Woods Chapter of the TAAO consists of 18 counties. Debra Courtney from the Polk Central Appraisal District is the President of the Piney Woods Chapter. Their purpose is to educate, promote ethics, and inform tax professionals in their duties in order to help the taxpayers of the state. Anyone will tell you, it's no fun paying taxes, but it is a very necessary thing. The Polk Central Appraisal District Employees have the huge responsibility of assessing property values in Polk County with a minimal sized staff. The job is enormous and often thankless. Under Chief Appraiser Carolyn Allen, Polk Central Appraisal District has managed to keep the necessary funding flowing in order to fund our local government. "It's not an easy job, but we're committed to serving our community and we'll carry out our duties to the best of our ability", Allen says. "Setting standards of professionalism, educate, enlighten each other, and the public about fair and equitable tax administration is what we do" Debra Courtney said. The Pineywoods Chapter of the TAAO promotes charities like Toys for Tots, Polk County Mission Center, SAAFE House and other local charities. Says Allen, "We're not just about property values, we're here to help the taxpayers with their property, with tax exemptions, with information, we'll do anything we can to help the taxpayers of Polk County". 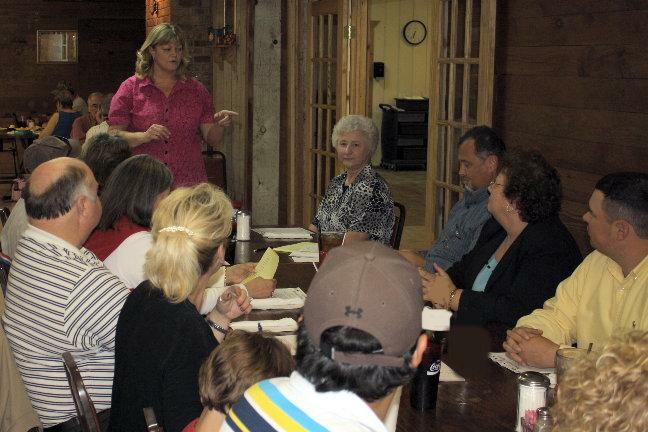 Piney Woods Chapter President Debra Courtney Addresses the meeting at The Texas Pepper Restaraunt.